How does the new Mk3 measure up in the 5D series? Many of you that follow my Facebook page or Twitter feed will have seen that I’ve recently added a new camera to my commercial equipment. Canon’s newest 5DMk3. Now although I’m a photographer and I use professional cameras on a daily basis, I’m not actually much of a camera geek and I don’t go in for knowing all the latest camera models and their exact specs. I don’t have the first clue as to how they differ between the others in the range. It might seems strange but its true. So when people say, “what do you think about Canon’s D500 or Nikon’s 300D” I’m afraid they’ll see a pretty blank look come across my face. It’s not that I don’t care far from it, but Canon and Nikon bring out more kit in a year than I have time to keep up with and being a photographer is more than what camera you have in your bag. My BIG photography tip to anyone thinking of buying in a DSLR system is not to get too hung up on the camera model its widgets or ultra complex metering features. Instead invest in great quality lenses, the best you can afford. Camera manufacturers rarely update their lens range and good glass is the most important factor when rendering high quality, sharp images. Far more so than the model of camera that’s attached to it. Its the bit that captures and forms the light onto your capture surface. It affects colour, distortion and flare, so invest in fast f1.4 or f2.8 lenses. A lot of manufacturers are building IS (image stabilisation) into their lenses, so if you can afford it I recommend these as pennies well spent. This translates into sharper images in low light situations without having to climb into ugly ISO ranges. Zoom lenses are great and I still use them, but I’m being drawn more and more toward fixed focal length lenses or prime lenses as they’re known. Anyway back to the new camera. 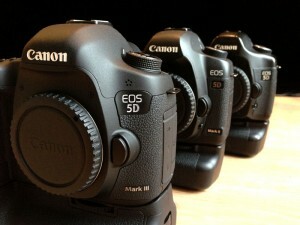 Since I started business I’ve used the Canon’s 5D range. They’re solid, reliable cameras and with a full frame sensor there wasn’t any magnification factor to have to content with. The 5d MK1 was/is a great little camera and I still love using it. It gives me that excited feeling of picking up my very first camera; a Pentax ME Super. I’ve always valued the effort that Canon have put into the 5D range. They push a lot of their best tech into this camera line and the Mk1 was a sensation due to the full frame 12.8 mp sensor and compact design. The only problem with this model was dust. The sensor was like a vacuum to it and you soon shed your fears about getting into the guts of this machine to clean the darn thing. The Mk2 came out and the game changed again, climbing to 21MP with auto sensor cleaning and it was time to upgrade. It was a superior leap forward, both in noise handling at higher ISO, but was now leading the way in film and movie making. There’s been so many amazing films and short movies that this camera has been part of, it would be difficult to list them all, but here’s a couple of my favourites. This camera alone and it’s convergent technology re-wrote the possibilites of film making, it’s versatility and shallow depth of field is used today by major film studios in blockbuster cinema movies and in standard television production. The quality of files and ease of use of the mk2 makes it a fantastic choice for multiple discipline creatives. So how could they improve the next model? Canon refused to go down the bigger and bigger route. They haven’t increased the sensor size much on this model, 1mp perhaps. But rather than looking at bigger they concentrated on making it better. Improving the quality of the data coming off the sensor. The noise levels are significantly reduced and even images shot at 16,000 ISO are fairly noise less and very useable. But for me the best improvements have been on the cameras handling. The camera is slightly heavier than previous models, but the ergonomics are far better. It feels ultra-solid in construction and fits my hands much more completely, in fact with the battery grip on it feels very much like the series 1 models. Of course there’s loads of other improvements on the stills and the video side. I haven’t got time to list them all and I’m still ploughing throughout the 400 page manual. However, here’s my killer features. The menus are better laid out, there’s a whole bunch more of them, so they had to be. The dials and buttons are more positive to use and lockable. The eye piece is now 100% instead of 98%, and its amazing how much clearer the image looks with that extra 2%. It’s got an additional SD card slot so you can separate JPEGs away from the main RAW files. Clever. It’s even got a digital level built into the camera. I’ve used this a lot since finding it, it facility helps with alignment with most shoots, but especially architecture and interior photography. Canon appear to looked at every feature on the old Mk2 and improved it. The focusing system has been revolutionised and they’ve built in-camera lens aberration correction. There’s multiple shooting modes High Speed 6fps and a new Silent mode, so if you’re shooting on movie sets or if you’re trying to be stealth within a meeting environment this is a killer feature. 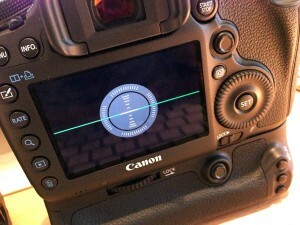 Canon have managed to improve the 5D range again. The mk3 is beautiful to handle, superior in image quality and jammed with features that let you control every facet of the capture process. If you’ve got an old Mk1 or Mk2 and thinking of upgrading…do it. You’ll be amazed. If you enjoyed reading this, please feel free to share this with others and, or join in the fun at the Facebook or Twitter pages. Until next time. Stay sharp.